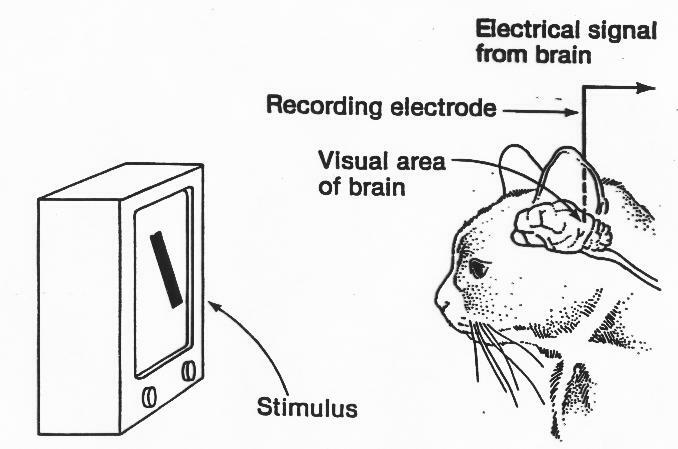 Word(s) of the Day (1) Feature detectors– specialized neurons that respond only to certain sensory information. David Hubel and Torsten Wiesel demonstrated that specialized neurons in the occipital lobe’s visual cortex respond to specific features of an image such as angles, lines, curves, & movement. EX. the area behind your right ear enables you to recognize faces. Damage to this area can result in (3) prosopagnosia, (aka facial blindness). Someone with prosopagnosia cannot recognize their own face in a mirror. Some conditions may be mistaken for face-blindness, for ex. a person who can easily identify faces but avoids looking at them because it causes them physical pain. This is actually a type of synesthesia, when one type of sensory input is interpreted by the brain as a different type of sensory input. Looking at faces may trigger a variety of sensory experiences, including music, fragrance, light or color, and even tactile sensations. I teach World History, Civics, AP Psychology, and AP Government at West Bladen High School. This entry was posted in Unit 4 Sensation and Perception and tagged feature detectors, Hubel & Wiesel experiment, perception, prosopagnosia, sensation. Bookmark the permalink.